↑ Գրիգոր Ղափանցյան: Հայասան՝ հայերի բնօրրան (ռուսերեն), Երևան, 1947: Григор Капанцян. Хайаса - колыбель армян. Ереван, 1947. ↑ Չալոյան Վ. Կ. // Հայկական Վերածնության մասին ՀՍՍՌ ԳԱ Տեղեկագիր հասարակական գիտությունների, № 12 . pp. 85-114. 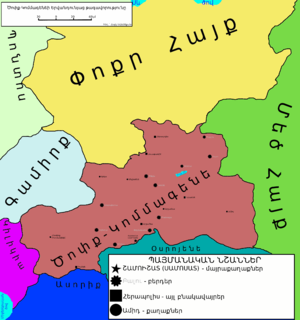 The Geography of Ananias of Širak (AŠXARHAC'OYC'). The Long and the Short Recensions. Introduction, Translation and Commentary by R. H. Hewsen, Wiesbaden, 1992. ISBN 3882264853, 9783882264852.